Social Media Profits is a link-posting scam disguised as a social media business opportunity. Watch out for the red flags below as you navigate through their sales page! Social Media Profits is one of the variant of link-posting scam that has taken a twist of social media flavor, and re-packaged as a social media business opportunity. The structure of the scam is very similar to some other link-posting scams we have reviewed earlier, such as Secure Home Profits and Learn How to Academy. In this Social Media Profits review, we will give you a detailed walk-through of the scam from its entry point, the sales pitch and sales material, down to the payment page and point out the red flags you should watch out for. Some of you may come across this crafted article in SM Job Review as a bait to make you click into the sales page of Social Media Profits. On the surface it looks like a legitimate and well-established website, so how do you tell it’s a fake? When I tried to navigate around the website (i.e. clicking on different tabs, images and categories), literally ALL of the links brought me to Social Media Profits. If you encounter any site like this in the future, be very careful especially if it involves making lucrative money from home. This is a relatively old trick in the make money online industry, and it still works for many scammers till date. This is one the standard homepage for this series of link posting scams. If you have read my reviews of other link posting scams, you will immediately recognize this layout, even though it’s changed slightly for Social Media Profits. The number of job openings available is a fake number used to create a sense of scarcity. If you visit the page one week or even one month later, the number will still be the same. One thing to note about the form is that it’s compulsory to provide your phone number before you check for availability of their program. It’s normal for online businesses to get some basic information from you such as first name and your email address, but if an unknown website asks for sensitive information such as your phone number, you have to think twice before giving it out. So if you are hesitating to give your number and found this review, please do not proceed further. I’ll walk you through the rest of the sales page and let you see that you did not pass up a great opportunity. One of the hallmarks of make money scams online is to create a lot of hypes and make false promises to get potential victims all excited about it, and eventually make a regrettable impulse purchase. 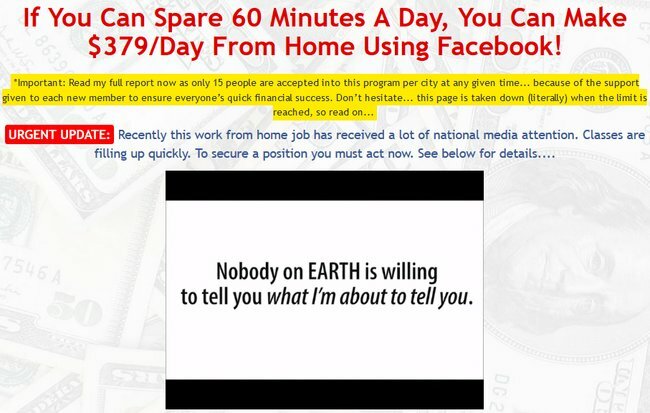 Making $379/day by sparing only 60 minutes a day is enough to get anyone who wants to work from home extremely excited. The page targets those who value financial freedom and time freedom, so the sales materials in this page naturally make exaggerated earnings that sound extremely simple. 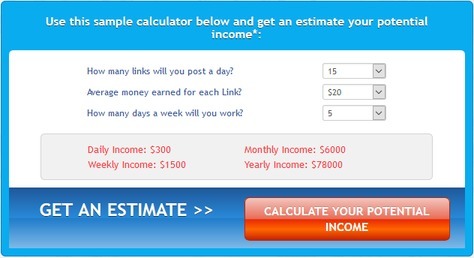 Social Media Profits even included a calculator on the page to let you estimate your potential income from their program. 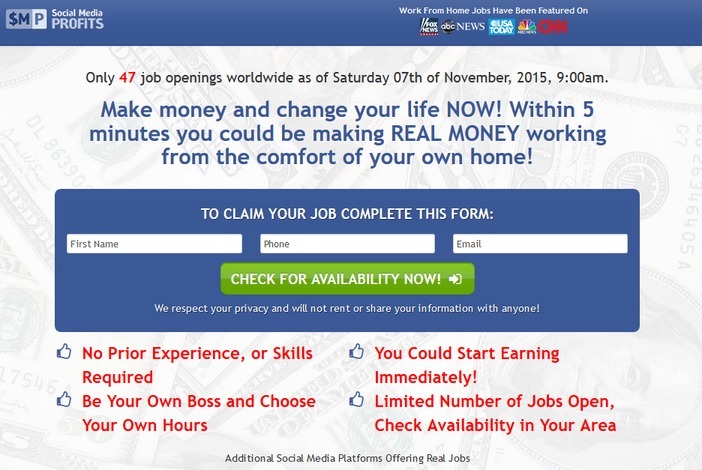 Again, this is just another tool to feed your imaginations and make you delusional enough to think that earning money online is as simple as posting a few links, and sparing only 60 minutes a day to make a full time income. Before revealing how their logically flawed program works, Social Media Profits did not forget to feed you another round of imaginations by showing you a few pictures of luxurious home, yacht and sports car. Why not, most people want to make good money online because they want to afford a more luxurious lifestyle. Social Media Profits claims that you can make $15 for every link you post on Facebook, and there are companies *desperate* for you to post their links to social media sites like Facebook. People who know something about internet marketing and social media marketing will immediately laugh it off and close the window within a second. Firstly, where are you going to post the links on Facebook? On your own account so you can annoy the living hell out of your friends? I believe you have came across spammy accounts that do nothing but post spammy links and advertisements. You don’t want your account to be one of those, do you? Will anyone buy anything from these spams? I highly doubt so. Why would the companies pay someone to do it then? Remember, this is a business. If you don’t generate sales for the companies, there is no reason for the companies to pay you. Secondly, if you don’t want to advertise to your friends, your only way is to go through paid advertising, which means you have to pay to get your links seen by other Facebook users. And advertising fees can go up to thousands per month, with no guarantee of seeing any results if you have no marketing skills. Thirdly, if you want to generate money online by posting useful links, you can do it through affiliate marketing without paying money to shady programs. The initial price of Social Media Profits is $99. For someone who has bought into all the hypes and false promises, $99 seems like an extremely good deal to make money from home with minimal effort. For the purpose of this review, I clicked into the payment page to see what is has to offer. Make money online scams have the tendency to make discounts after discounts, so I wanted to see if Social Media Profits is no different. As expected, when I tried to click away from the payment page, I triggered the first “limited time discount”. So I wanted to see if there will be additional down-sells if I try to navigate away once more, and here comes the second discount. I was able to bring down the price to just $49 after making two attempts to close the browser window. Talk about a good deal! This is the final red flag of Social Media Profits. If the program is as good as they claim, why do they have to subject themselves to discount after discount just so you can benefit from it? They are literally begging you to buy into their scam. Should I Buy Social Media Profits? What Is The Millionaire In PJs? They are saying its not refundable which is bs the website said 60 money back garentee … The email they sent said they will refund part so it charged me 99 + 49.99 + 29.99 they said they will only refund 80 20 and 10 so trying to change me 70 and said I can still have access … I said no I don’t want it I want full refund. Got an email back stating it was a valid charge and non refundable …. I stated bs it said money back garentee and only had it for a day … Stated I would contact the BBB but waiting to hear back again … Also stated that it comes up as skin care products on my account which clearly it isn’t …. Unfortunately this is the reality of online scams where they don’t value promises and guarantees. I’ve had similar experience and I hope you get your money back. Even if you can’t get a full refund, take it as a lesson and move on. Don’t dwell on it for too long. Your time will be better spent on a legitimate online opportunity (Wealthy Affiliate). I wish you all the best and do keep me updated. Hi Jesseca, is there any contact or support within the members area? Request your money back and be firm with it. Also check your credit card to see if there are other unauthorized charges. Ok well bad thing is I used my debit card should I be changing my account info ?? Although I would hate for them to say that’s only way they can give me my money back is to credit it back to my account …. I havnt gone into it yet just bought it today before coming to work … Just not sure what to say just decided I’m not interested ?? Since it’s a 60 days money back guarantee they’ll have to refund you no matter what. You can just tell them that you have changed your mind and that you want a refund. They may try to keep you in the program but you have to be firm. As long as there are no unauthorized charges made to your credit card, you don’t have to change any account info.